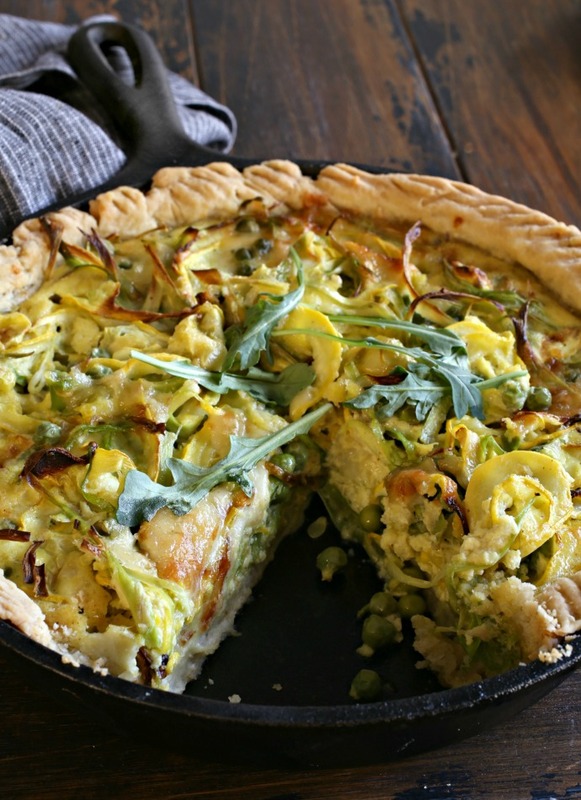 I haven't made quiche in a while so I thought it would be a good way to gather all the vegetables into one dish. But I also wanted something with a bit more oomph. Experimenting with different condiments is a great way to interject extra flavor and one of the easiest oomph additions is mustard. I grabbed my fridge staple, Maille Dijon Original Mustard, and got creative with the pastry dough. I already knew adding it to the egg base would be great but I was hoping for a crust with an extra savory note. Success! My standard savory butter crust with a touch of olive oil and a big dollop of the mustard got me the exact burst of flavor I was after. 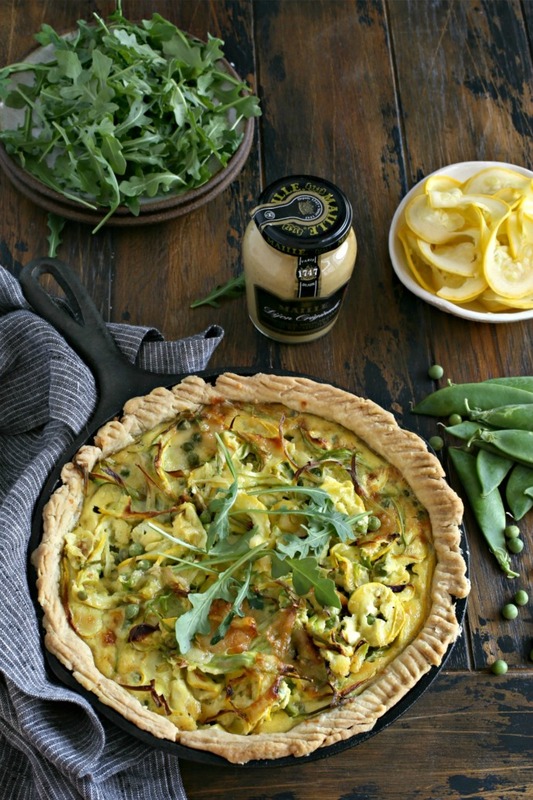 I served the tart with the fresh arugula on top, dressed in a mustard vinaigrette, of course. This dish definitely didn't last long in my house and now I really want to make another one. Enjoy! 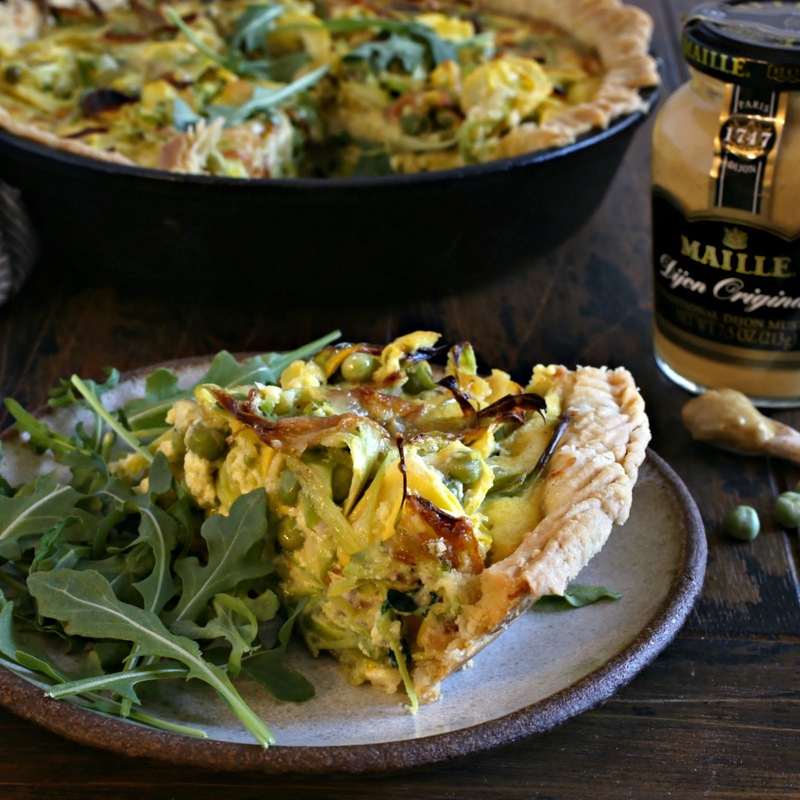 Win a Maille brunch makeover! 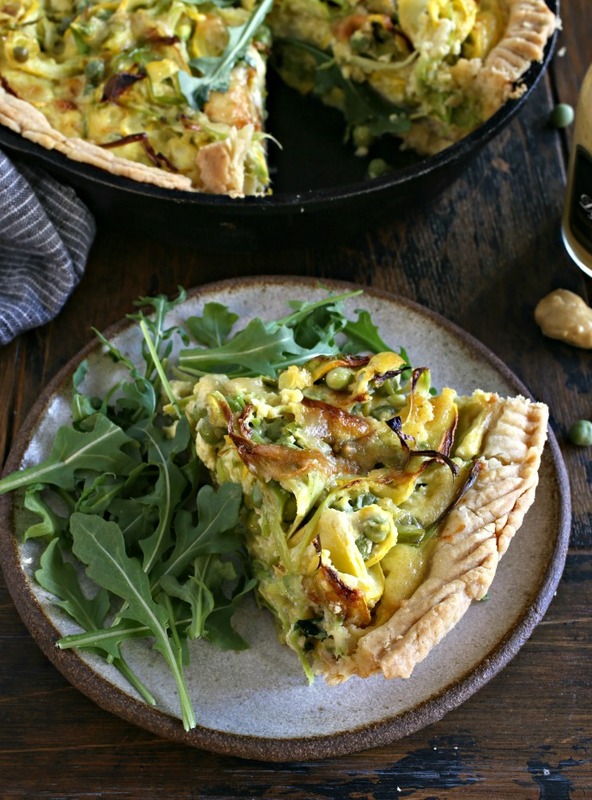 Recipe for a cheesy savory tart filled with asparagus, peas and yellow squash. Add the flour, salt and butter to a food processor and pulse a few times until the mixture resembles coarse crumbs. Add the mustard and olive oil and pulse a couple more times. Pour in the ice water and pulse until the mixture forms a dough ball. Cover with plastic wrap and refrigerate for at least one hour. On a well floured surface, roll out the dough to an 10" round and place into an 8" cast iron skillet. In a large bowl, whisk together the eggs, cream, milk, mustard, salt and pepper. Stir in the shredded cheese and the peas. Thinly slice the asparagus and squash. Alternatively, you can use a vegetable peeler to slice thin strips. Add to the egg mixture and pour into the prepared pan. Bake for 50 to 55 minutes or until the mixture is set. This recipe is sponsored by Maille. Thank you for supporting the products I love and use in my kitchen.